Driving directions to sale barn or mower shop. Rozell’s Small Engine Repair is located at 108 E. 1st. That is at the junction of Manvel Ave.(Main St) and 1st, just east past the railroad tracks. It is about 4 blocks west of the Route 66 Interpretive Center on 1st St. Rozell’s Ministorage is located behind the mower shop. Click here for alternate directions to Countryside Auction to avoid the construction. 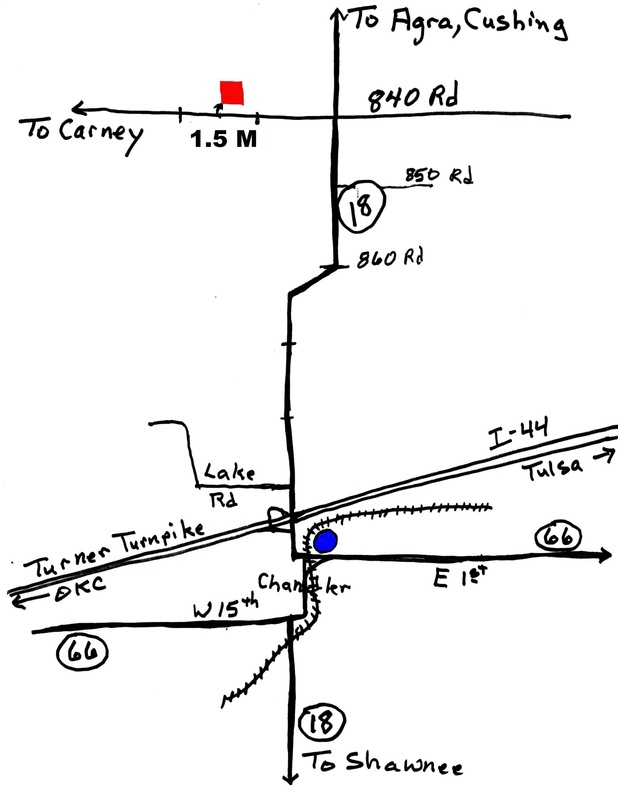 At the Junction of 33 & 18 between Cushing & Perkins go south 13 miles then west 1.5 m on 840 Rd. Construction is coming along at Twin Bridges on HWY 18 N of Chandler. Some black top has been laid and hopefully but Apr 27 the crossing at 840 Rd will be in good shape. supposed to be a good sale weekend so come on out and see what we get.